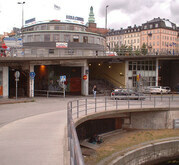 Slussen is a Train station, Tube station, Bus station, pedestrian bridge, square, party central, shopping center, lock, parking space and probably much more. It is a place of true programmatical overlap, and one of the few places in Stockholm that hasn't been tidied up. A wonderful relief from the stylist regime around it. Unfortunately the concrete is falling apart and a new design has been selected. The new design is a shopping mall nightmare of polite scandinavian quasi modernism.